BM-1009AB... 20 Count Antique Brass Round Head Slotted Wood Screws 5x5/8. Made of solid brass. Some jobs need a solid brass screw. 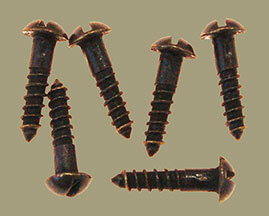 Holes should be predrilled as solid brass screws are softer than steel.